Who are the best fantasy football plays for building an optimal DFS lineup in Week 9 of the 2018 NFL season? As we do every Saturday, this piece brings you the DFS locks of the week. Newton has a perfect matchup in Week 9. He’s at home against the last-ranked Buccaneers passing defense in a game with a projected over/under of 55. Newton thrown for multiple touchdowns in every game since Week 1, and he continues to see 8-10 rushing attempts per game. You can afford to pay up for him in cash games this week, too. Brees at home: 348 yards and 2.7 TDs per game. Brees on the road: 236 yards and 1.5 TDs per game. Brees in Week 9: At home against the high-scoring Rams offense in a game with a projected over/under of 60. This is a can’t-miss spot. Goff is the other quarterback in that high-scoring Rams/Saints game, except his matchup is even better. The Saints rank last in pass defense and have given up the third-most fantasy points to opposing quarterbacks this year. The Rams are also underdogs, which means Goff should be passing all game long. Since being outshined by Mark Ingram in Week 5, Kamara has dominated touches over the last two games, with 19 touches in Week 7 and 20 in Week 8. He has three touchdowns over the last two games — and he’s extremely underpriced (at least on DraftKings) given that he’s still seeing about 20 touches per game. McCaffrey draws the Buccaneers, who have given up the ninth-most fantasy points to opposing running backs this year while being particularly prone to receiving backs. Tampa has ceded three passing scores to running backs this year, tied for third-most in the NFL. Simply put, Carson is too cheap in DFS considering the volume he’s seeing. With an average of 24 touches per game over the last month, Carson has topped 100 yards in three of his last four. He’s seeing goal-line work to boot. The Vikings are supposedly going to play Dalvin Cook for somewhere around 10 snaps in Week 9, and while that puts a bit of a cap on Murray, it shouldn’t remove him from your player pool this week. 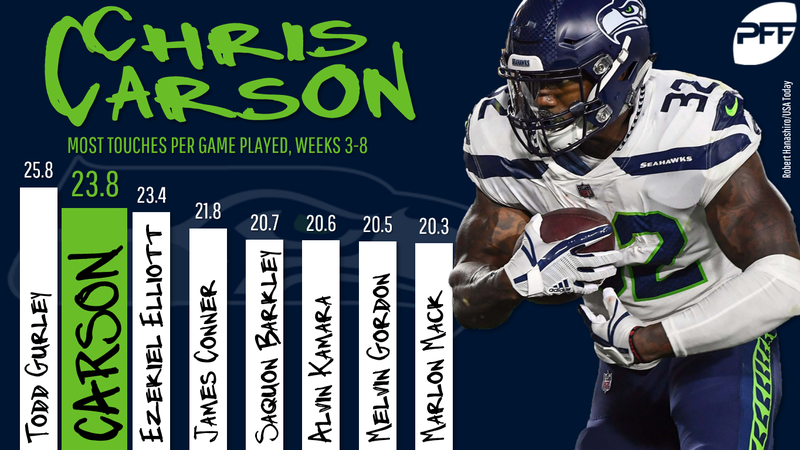 Murray has been a top-10 fantasy running back every week for the last three weeks, and he’ll be the lead dog again in Week 9 against the Lions, who have given up the sixth-most fantasy points to opposing running backs this year. Thomas is far underpriced given that this Rams/Saints game could produce over 30 points for each team. Thomas is averaging 10 receptions, 114 yards, and a touchdown at home this year. Woods has the third-best individual WR/CB matchup of the week against the Saints secondary in New Orleans. Collectively, New Orleans has given up the most fantasy points to opposing receivers this year. Sutton became a glaring Week 9 DFS value once Demaryius Thomas was traded. Sutton was already playing well — he had at least three targets in every game this year, and he scored in two of his past four games — so an expanded role makes him a likely breakout candidate. Get him while he’s cheap. Kelce is the only premier tight end on the main slate, and even though it’s technically not the world’s best matchup against the Browns, this Chiefs offense has steamrolled everyone they’ve faced. Kelce has at least five receptions in every game since Week 1 and he’s already topped 100 receiving yards three times this year. Olsen has a favorable matchup against the Buccaneers, who have given up the fourth-most fantasy points to opposing tight ends this year. Olsen has a touchdown in back-to-back games, and Tampa has coughed up a touchdown to tight ends in four of their last five. The Panthers have given up the most fantasy points to opposing tight ends this year while allowing one touchdown to the position in five of their last six games. Howard has been cruising this year, with at least 50 yards in six of seven games and two touchdowns in his last three outings.